Everybody has heard the advice that you should stretch before a run. It’s common knowledge. But what about stretching after you’ve crossed the finish line? Worry not, as we have come up with tips about the best post run stretches to cool down your muscles. After a hard race, it’s tempting to just sit down and rest, but experts say that it’s far better to immediately hydrate and stretch those warm, tired muscles to increase elasticity and reduce soreness. Getting off your feet too soon will just make you stiffen up. Moving those muscles thru various stretching exercises is key for long term health. These best post run stretches are great for your muscles after a race. They should be done dynamically, that is, held for only a second or two, just to the point of tension. Release for a moment, then stretch again, for a total of 20 reps.
Hamstring stretch: First on the best post run stretches, is to extend one leg out in front of you so that your heel is on the ground. Bend your other knee and slowly lower your hips, as if you’re about to sit on an imaginary chair. Keep your back straight and tall. Repeat on the other side. 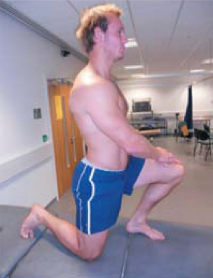 Calf stretch: Stand with both feet on a curb, step or short box. Move foot back until your heel is hanging off of the step. Now lower that heel toward the ground beneath the step until you feel a deep stretch in your calf. To deepen the stretch, bend both knees. Repeat on the other side. Calf stretch, version two: Step your left foot forward, both feet pointing to the front. Bend your right knee while keeping your back straight. Push your left heel into the ground and keep your leg straight. Repeat on the other side. Glute and piriformis stretch: Cross one ankle over your opposite knee and lower your hips down in to a squatting position, as if you’re sitting down on an imaginary chair. If you need to, hold onto a friend or a support for balance. Gently push down on your elevated knee. Repeat on the opposite side. Chest stretch: Stand with your feet shoulder-width apart. Put your hands, fingers interlaced, at the back of your head, just above your neck. Squeeze your shoulder blades together while you press your elbows back and to the side, opening your chest. Quad stretch: Stand on your left leg and bring your right heel back so you can grab your ankle or foot with your left hand. Pull your foot toward your tailbone. Pull gently, and keep your knees aligned. Keep your back straight. Repeat on the other side. Hip flexor stretch: Another example of the best post run stretches is to stand with your left foot forward, both feet facing straight. Keep your back and left knee straight and bend your right knee slowly. Press your right buttock forward until you feel the stretch across the front of your right hip. Repeat on the other side. 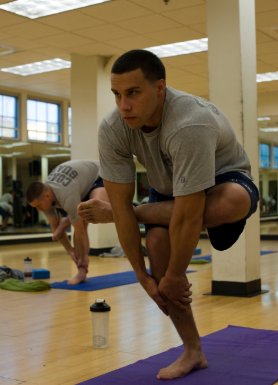 Thigh stretch: Bend your left knee and grasp your foot with your left hand. Gently pull your foot toward your buttocks while keeping your knees together. Repeat on the other side. Iliotibial band stretch: Cross your right leg behind your left leg and keep both feet flat on the ground. Lean to your left side and push your right hip outward. Keep your back straight and your hips tucked. Repeat with the other side. Lower back stretch: Lie on your back with your knees bent and both feet flat on the ground. Pull one knee gently toward your chest until you can feel a stretch in your lower back. Hold for up to 15 seconds, then repeat with the other side. Next pull both knees to your chest and hold for 15 seconds. Buttock stretch: Lastly on the best post run stretches is, lie on your back with your knees bent and both feet flat on the ground. Cross your right leg over your left thigh. Grasp the back of your left thigh with both hands and gently pull your left leg toward your chest. Repeat on the other side.